SInce I’ve started working with Divest Harvard, I have learned the lexicon of organizers. When I first learned about this vocabulary, I found it rather strange because it turned human interactions into formulaic and impersonal phenomena. Therefore I have tried to create my own approaches and terms for organizing. First, many organizers use the term “one-on-one.” The idea is that you talk with a person who you think might be sympathetic to your movement. You get to know them, find “shared values,” and recruit them to your cause. But to me, the term “one-on-one” sounds manipulative, like you are meeting with someone just to get them to do what you want to them to do–join your group. Instead, I like to call them for what they are: “personal conversations.” Instead of approaching the conversation with the goal of asking pointed questions, I turn these meetings into casual conversations that place my particular cause within a larger context, build a relationship with that person, and lay out the ways that they can get involved. Second, I constantly hear the phrase “spectrum of allies.” This is a way to categorize all the people out in the world and their relationship to your campaign. 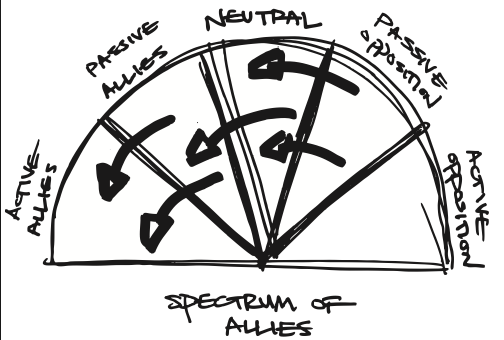 Yet whenever I see this spectrum, I imagine people as pawns that I’m trying to move from passive opposition to passive allies (or whatever it may be). As an organizer, I do not want to objectify people and treat them as pawns on my game board. And so I refrain from using this formulation. Lastly, many organizing trainings that I have been to try to create bonds between group members through what I call “fake depth:” sharing two minutes of personal information, a difficult obstacle that you’ve overcome, or something like that. Once this sensitive information is shared in a session of administrated intimacy, people proceed as they did before, and intimacy is left hanging there without anyone to process or respond to it. I want to get to know my fellow activists and develop relationships in a meaningful way, but you can’t know someone based on these superficial interactions. Instead, I think that it is important to focus on what does connect climate activists: the passion to mitigate climate change and fight for climate justice. This is the glue that binds us.